Tourists Worry: How Long Before Cuba Loses Its Nostalgic Charm? : Parallels As relations between Cuba and the U.S. move toward normalization, many worry Havana's iconic sites could be forever spoiled by an influx of tourists and cash. Tourists Worry: How Long Before Cuba Loses Its Nostalgic Charm? Tourists fill the famous La Bodeguita del Medio bar where U.S. author Ernest Hemingway used to drink in Old Havana, Cuba. It's the tourist mantra these days: Get to Cuba before it loses its 1950s nostalgia and turns into a capitalist tourist trap. This week saw 54 years of Cold War-era hostilities warm up in the Caribbean sun: On Monday, Cuba and the U.S. reopened embassies in each other's capitals, a major step in the normalization of relations between the long-time foes. The closer ties over the last few months have prompted a surge in tourism, and a perception that the island is about to undergo a radical transformation. 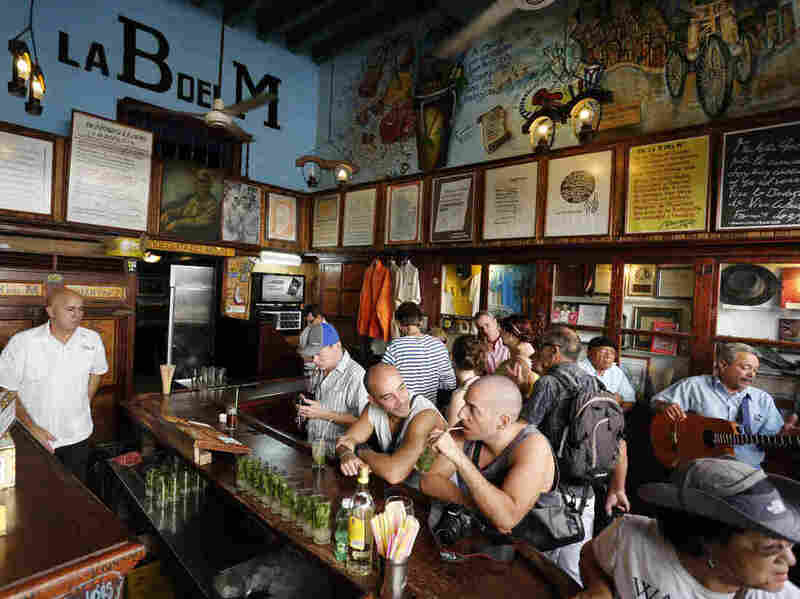 While visitor numbers are way up this year, it's business as usual at Old Havana's obligatory tourist stop, La Bodeguita del Medio watering hole. The thirsty guzzle mojitos in its rustic, crowded bar, while the hungry eat the local favorite dishes of ropa vieja and tostones in the packed restaurant, with its bright blue walls covered in the signatures of visitors from around the world. Right on cue, French tourist Regis Beuche predicts Cuba's capitalist embrace is imminent. "It can't stay like this anymore," Beuche says. "There are no more communists in the world, so it's time to change." Keeping with the conventional wisdom these days, Beuche says it will be an American tourist invasion that fans the winds of change hardest. "American people don't respect this currently," he says. "I mean, it's difficult for an American to think different than an American." While it's not hard to find a Frenchman to take a swipe at an American, it is the common fear among tourists here, that a McDonalds or Starbucks will pop up among the old city's stunning mix of neoclassical and colonial architecture — much of which is getting a paint job and refurbishing. 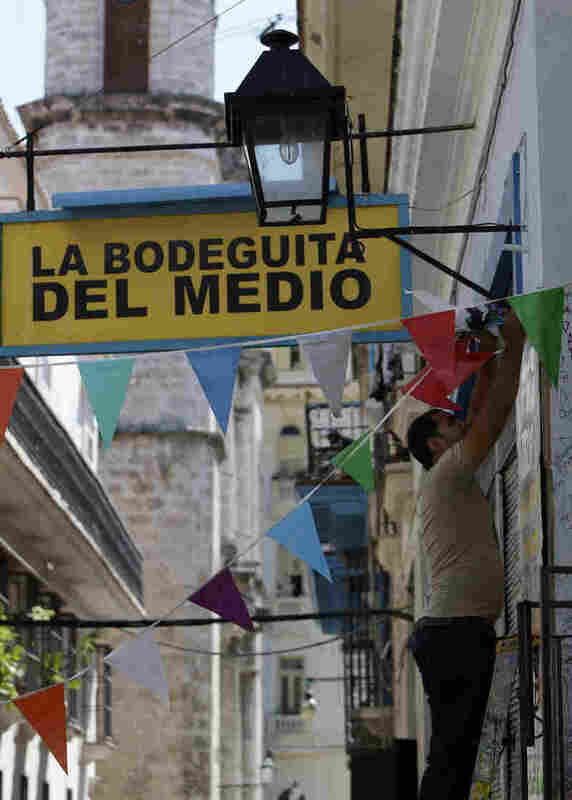 Carlos Rodriguez has been a waiter at the state-run Bodeguita for 23 years, and he says don't worry, the slight opening of the economy taking place now won't spoil the country's charm. "These changes are well thought-out and are taking place slowly," assures Rodriguez. And also on cue, he adds that Cuba will never become capitalist: "We're just trying to make our socialism a little more perfect." As a ringing bell marks the start of the next tour of the old city's Rum Museum, Canadian Reinette Otte and her husband say they wouldn't mind some American convenience about now. "We were actually looking for a McDonald's so we could get a bathroom, to be honest," Otte says. Tourism spiked in the first five months of this year, up more than 15 percent. Even now, during what is usually Cuba's low season, hotel and tour bookings are soaring, straining the country's insufficient tourist infrastructure — there are only about 60,000 hotel rooms in all of Cuba. Anthony Policastro, of Hoboken, N.J., says it takes a particular patience to be a tourist here. The Corner of the Cretins, mocking Ronald Reagan, George H.W. Bush, and his son George Bush and Cuban dictator Fulgencia Batista, greets visitors near the entrance of the Revolution Museum in Havana. "You have to be prepared for a little bit more grittiness, and you've just got to plan for things not going the way that you expect," Policastro says. You need political patience, too. Policastro visited the Museum of the Revolution, which takes many a swipe at "Yankee aggression" against the Cuban people. 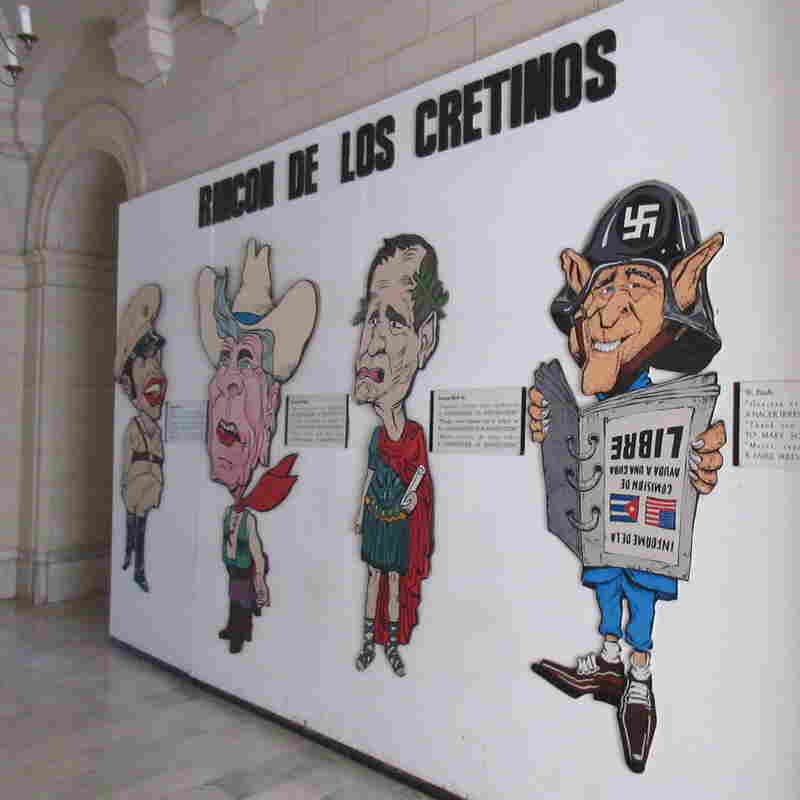 On a wall right off the entrance, titled the Corner of the Cretins, is lined with cartoon cutouts of the former Cuban dictator Bautista alongside Ronald Reagan, George H.W. Bush and George W. Bush. Some things may take longer to change than others.